These are a few ideas I had at the end of my second year relating to phenomenal experience. These are a few loose ideas for final pieces or perhaps instillation ideas if were to be presented in a gallery space. As the paintings are about experience I thought it would be interesting to curve the canvas, so that the viewer is surrounded in order for peripheral vision to be enclosed within the image. By accounting for peripheral vision, this gives the illusion that the painting has no edges. With this in mind the viewer would be suspended with no reference point such as an edge in order to understand where their position is within the painting. 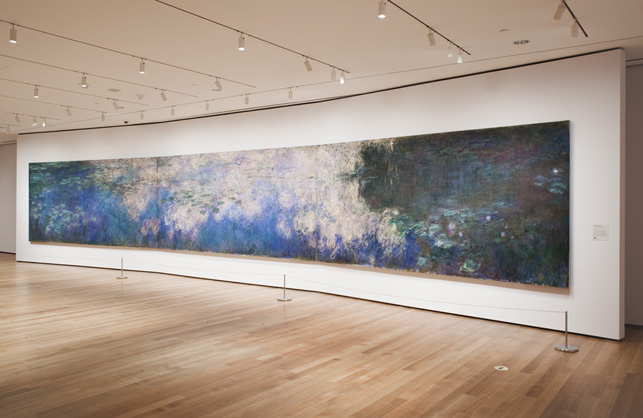 At the MoMA gallery one of Claude Monet’s water lily paintings is displayed on a curved surface, encasing the viewer in this expressionist world. So, this is not such a new idea. Another idea that although being my favourite would be quite expensive and tricky to pull off, is that of creating a spherical environment in which the perceiver would walk around and into. Experiencing both inside and outside the shape. Again with this idea that the viewer would have no reference point of an edge, or any clue of foreground or background the visual experience would hopefully give the viewers body a sense of floating or imbalance. In my third year I’d like to see if could create a few little mock up ideas possibly using modelling foam or vacuum forming half spheres and playing around with materials. Lets see what the future holds!